I have a Hoover WE140 Washer / Drier, and for the past few months, it has not been drying. I’ve eventually gotten round to taking off the lid and having a look. The most obvious conclusion to jump to is that the drier doesn’t work because the Element has broken. Apparently, this is not often the case! The washer / drier has three heating elements inside - the first is to heat the water during the washing cycles (this is located down under the drum). The other two are for the drying cycles (for 2 different heat levels, I presume). Under the lid, you can see the top of the two heating elements (called upper and lower). There are also three thermostats on the top, two with a little peg on them (2 and 3), and one without (1). Thermostat 2 is connected to Live, and the other end is connected to one of the heating elements. Thermostat 3 is connected to Neutral, and the other end is connected to the other heating element. These two thermostats are normally closed, and I presume become open circuit when a maximum temperature is reached. The other thermostat (1) is supposed to be normally closed, and only goes open when over-temperature is reached. The first thing I did was to turn off the power, and measure the resistances of the heating elements and the three thermostats. The heating elements had a low resistance and were not open circuit, so I presumed that these were fine. Thermostats 2 and 3 were closed, and thermostat 1 was open. From this, I deduced that thermostat 1 had failed - but why? I had a problem quite a while ago, where the water inlet valves were not closing off. Until I realised this, I had been running the drier for longer and longer to get the clothes dry. I have noticed that Hoover have released some new thermostats, to take into consideration lengthy repeated drying cycles, which were causing many dryers to trip. 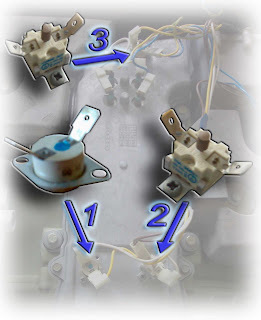 In replacing the inlet valve, I believe I have fixed the cause, however I have ordered a complete suite of three thermostats to fix the symptom (broken thermostat 1), and reduce the possibility of this happening again in the future!